Korean grammar is notoriously difficult for foreigners to master but is essential for those wishing to learn Korean. This book is the only comprehensive guide to the correct usage of Korean verbs available for English-speaking learners. 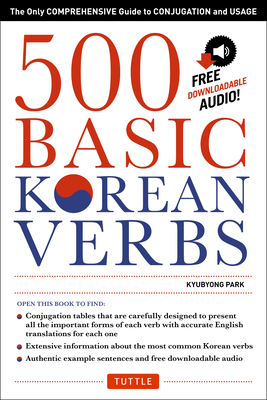 Each of the 500 high-frequency Korean verbs is presented in a convenient single-page format that gives the verb's meaning and pronunciation and displays the verb's 48 main tenses, speech levels, and moods (all accompanied by romanizations). Also included are a handy guide to the Korean language and verb conjugation, reference tables of basic Korean verb types, and three indexes (Romanized, Hangeul, and English). Conjugations by tense, speech levels, and mood. "Model verb" system quickly identifies each verb's pattern. Sample sentences demonstrating the verb's correct usage. Free downloadable audio provides pronunciations for the verbs and 1,000 example sentences. Korean characters (Hangul) as well as romanized pronunciations to help English speakers. A two-color design makes quick reference easy. Kyubyong Park works in the field of information technology and has also been an editor at an educational publishing company focusing on language practice books for Koreans learning English. His expertise in the different learning techniques for these two languages results in an efficient teaching approach. He is the author of several language books published in Korean and is the coauthor of Korean for Beginners (Tuttle Publishing). He lives in Seoul.